Commit a lot of money to a treatment program which may kill him? -We were fortunate in that we could manage the estimated $3500.00 financial burden of the treatment program, but did we want to? Ray had not been with us very long and was clearly carrying a lot of emotional “baggage” from his past. While it would be nice to believe that he would adapt to be a lovely family pet, nobody could offer us that guarantee, so we would be investing a considerable amount of money in a dog with unknown potential. Furthermore, treatment consisted of a series of deep muscle injections with an arsenic-based compound which should kill all the heartworms, however, when heartworms die, the pieces of worm can cause restrictions or even a blockage. There was a significant possibility that Ray could die from congestive heart failure. To minimize this potential outcome, a dog had to be kept as calm as possible in order to maintain a very slow heart rate. Life for Ray, and for us, would be very difficult for the next six months or so. Do nothing? – This was technically an option but, in reality, would have been a cruel and totally irresponsible decision. His quality of life would have slowly deteriorated as the heartworms spread, causing damage to his lungs and other organs throughout his body. Death would have been his only escape. Return him to OMHS? – We knew they would have taken him back, but that raised some issues. We would be avoiding making the difficult decision by transferring the responsibility to OMHS. This rationale is against my core belief of accepting one’s responsibilities. Returning him to OMHS also had some very questionable ramifications in that they would probably not be able to adopt him out again. Who would want to take on an unknown dog with a serious (and expensive) health issue? Would OMHS be prepared to finance the treatment of a single dog when they are totally dependent on voluntary financial contributions and are constantly fund-raising in order to maintain their day to day services? The more I thought about Skeeta, the more I decided that Ray deserved an opportunity to live and it would be my goal to ensure that he had that opportunity. My decision therefore was to keep him with us and start treatment as soon as possible. Fortunately, Carol had come to the same conclusion and so treatment was scheduled over the summer. What sort of friend would I be to now walk away from him, and leave him to whatever fate would await? Ray could well die during the heartworm treatment, but then he could also survive it. I was very happy to commit whatever was necessary to ensuring that he had the best chance possible of a long and happy life. I suddenly realized just how important he was to me. I loved this guy! 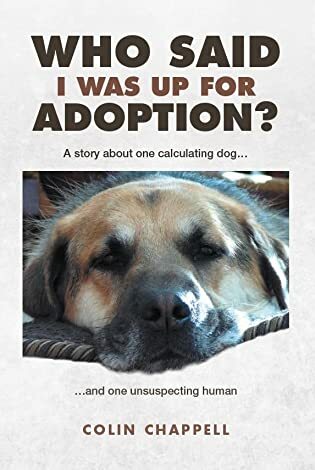 The above was copied from my book about Ray, “Who Said I was up for Adoption?”, click/select book cover in column on right for more information. You are doing the right thing! Thank you for committing to save his life, even if the cost is high and a total sacrifice in time and effort, as well. If your dog is family, the other alternatives are just wrong … bless you and your family for you have your heart in the right place. I hope he will do well with treatments. Please post your progress whenever you can… I would love to know how things are going. Ray’s disease definitely pulled you closer to each other. Ray and I might add, us are very fortunate with your decision. Thank you for your commitment and advocacy! We love ’em to bits don’t we. I remember when HW tx was $400. I wonder if it has become that expensive in the states, too. Anyhow, we are all glad for you and Carol and Ray, as well as all of us who get to follow along on this happy journey.